World affairs have been a constant presence in Mika Brzezinski’s life. The daughter of former National Security advisor Zbigniew Brzezinski, she is the co-host of MSNBC’s Morning Joe. As the Democrat to her partner Joe Scarborough’s Republican, Brzezinski spends each weekday morning debating the headlines of the day with a roundtable of political insiders, journalists, and newsmakers. TIME magazine has called Morning Joe “revolutionary.” The New York Times ranked it as the top news show in 2008, and a 2010 follow-up praised Brzezinski and Scarborough’s natural repartee and off the cuff commentary. Exclusively represented by Leading Authorities speakers bureau, her presentations give audiences a smart, savvy, and insightful perspective on the news of the day and an inside look behind the scenes of a hit morning show. Repeat Best-Selling Author. 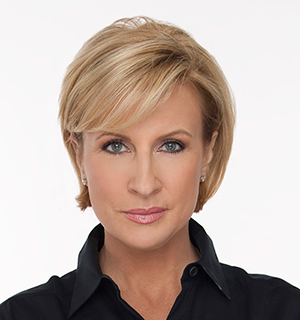 Mika Brzezinski is a best-selling author. Her fourth and most recent best-selling book, Grow Your Value: Living and Working to Your Full Potential, is a follow-up to her second, New York Times best-seller Knowing Your Value. Grow Your Value gives women the tools necessary to advocate for themselves and grow their financial futures – both professionally and personally. Knowing Your Value discusses perceptions of value and how successful women today have achieved their deserved recognition and financial worth in the workplace. Her third best-selling book, Obsessed: America’s Food Addiction–and My Own, details her struggles with food and her role in the war against obesity. Her first book, All Things At Once, was also a New York Times best-seller. In it, she discusses the challenges of career, family, and the news business with the style and grace that have made her one of the rising stars of morning news. Long-Standing Journalism Career. Brzezinski began her journalism career in 1990 at ABC’s World News This Morning. A year later, she moved to Tribune-owned Fox affiliate WTIC-TV/WTIC-DT in Hartford, Connecticut. There, she progressed from an assignment and features editor to a general assignments reporter. In 1992, Brzezinski moved to a CBS affiliate, becoming its weekday morning anchor in 1995. In 1997, she left that role to join the CBS network news, where she served as a correspondent and anchor for the overnight Up to the Minute news program. In 2000, Brzezinski took a short hiatus to co-host MSNBC’s weekday afternoon program Homepage, and in September 2001, she returned to CBS to become their principal “Ground Zero” reporter for the September 11, 2001 terrorist attacks. Brzezinski was broadcasting live from the scene when the south tower collapsed. Prior to rejoining MSNBC in January 2007, Brzezinski was an anchor of the CBS Evening News Weekend Edition and a CBS News correspondent who frequently contributed to CBS Sunday Morning and 60 Minutes. After returning to MSNBC, Brzezinski anchored the Up to the Minute news and primetime newsbreaks during the week, filling in on MSNBC Live weekdays and on the weekends. In 2007, Brzezinski joined Morning Joe. A native of New York City, she attended Williams College and received a degree in English.